The Ayeyawadi-Chao Phraya-Mekong Economic Cooperation Strategy Summit (ACMECS) should focus on increasing the competitiveness of its member nations by linking markets, forming regional production and supply chains, and improving the quality of human resources. This is one of the three main goals that Prime Minister Nguyen Tan Dung recommended in his speech at the 5th ACMECS chaired by Lao PM Thongsing Thammavong in Vientiane on March 13. PM Dung said their joint efforts at ACMECS need to support the establishment of the ASEAN Economic Community by 2015, ensuring regional sustainable development, and the management and utilisation of natural resources of the Ayeyawadi, Chao Phraya and Mekong rivers. ACMECS cooperation programmes should focus on promoting trade, investment and tourism collaboration by improving the business environment, promoting regional connectivity through the East-West Economic Corridor (EWEC), the North-South Economic Corridor and the Southern Economic Corridor (SEC) and other transnational transport routes, he added. According to the PM, it is necessary to boost high-quality human resource development through scholarship and knowledge-exchange programmes among domestic and international vocational training establishments, combining syllabuses with businesses’ demands as well as encourage the business sector to take part in ACMECS projects. 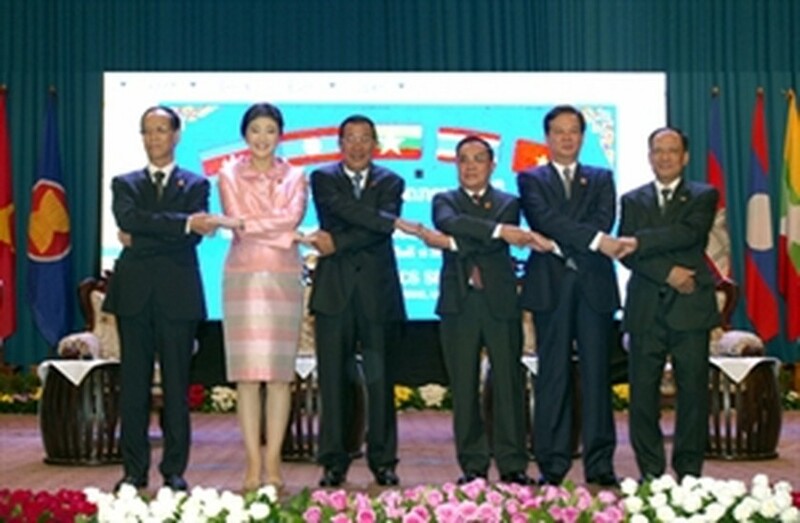 At the summit, leaders adopted the Vientiane Declaration and the ACMECS action programme for the 2013-2015 period, which aims to link ACMECS cooperation with the building of the ASEAN Economic Community by 2015, the implementation of the master plan on ASEAN connectivity, and raise ACMECS member nations’ competitiveness, role and position in global production and supply chains. The conference reviewed 10 years of ACMESC cooperation, the implementation of the Phnom Penh Declaration and the 2010-2012 action programme in priority cooperation fields such as trade and investment, agriculture, industry and energy, transport, tourism, human resource development, healthcare, social welfare and the environment. The leaders reaffirmed their commitment to implementing the targets of the Bagan Declaration for the sake of good neighbourliness, peace, stability, and development in the region. Over the past years, Vietnam’s combined trade turnover with Cambodia, Laos, Myanmar and Thailand rose from 7.1 billion USD in 2009 to 12.8 billion USD in 2012. In addition, transport among the five countries has considerably improved thanks to the EWEC and SEC as well as the signing and implementation of bilateral and multilateral agreements to facilitate transport, said participants at the conference. ACMECS 6 will be held in Myanmar next year. On the day, PM Dung and other leaders talked with the ACMECS business sector, pledging to further improve the business environment and facilitate trade and investment exchange to make ACMECS a top choice of regional and global businesspeople. The PM highlighted the role of the business sector in national socio-economic development, and regional integration and cooperation. He proposed that the ACMECS Business Council should be involved in implementing the regional action programme for the 2013-2015 period, and hoped to receive feedback from businesses to make prompt adjustments. The leaders said the efforts of the five countries’ Governments in promoting regional cooperation cannot achieve practical results without the business sector’s support and involvement. Policies to facilitate trade, investment, tourism, industrial development, energy and human resources aim to create favourable conditions for businesses to make profit, contributing to improving people’s lives and ensuring social security and stability.